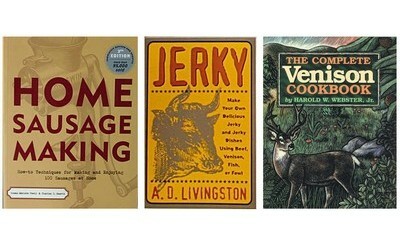 Books are the perfect tool to learn how to make beef jerky or sausage at home. We have a great selection of books to learn how to do everything from butchering your game to processing the meat.It is not as hard as you think and these books will help you learn how easy it really is. If it walks, flies or swims, this book will show you how to make jerky from ground meat, meat strips or chunks of meat. The book covers jerky making from the pioneer days up to the modern methods of today. Learn to make jerky in the dehydrator, oven smoker, sun and other ways. A whole section is dev..
A comprehensive guide to making sausages of all kinds: beef and pork sausages, cased and uncased, fish and shellfish sausages, sausages from poultry and game, emulsified sausage, cured sausages, fermented-style sausages and more. Complete instructions are provided for grinding meats, stuffing, curin.. The author of Sausage Making instructs you in how to use the different types of casings, types of bacteria to be aware of, smokehouses and how to make one. He then explains the various types of sausage; fresh, dry and semi-dry, as well as jerky making. There are over 230 recipes of every kind of sau..